I am reluctantly writing a tale of gnar about Maliko. It’s not a continuously spooky or crazy run so I don’t want to paint a picture of Maliko as some kind of fear fest. This story is about a run that pushed me to the brink of fear. We know every day out there is different. The ocean can throw whatever it wants at us and we don’t get any say in the matter. Our choice is pretty much limited to making the commitment to launch or not. Once you make that decision, you are all in, you can’t turn back and quit. It’s mid-July now and the middle of summer race season. The M2O is a week and a half away and Maui is full of accomplished paddlers from all over the planet. Because it’s summer, the ocean has been pretty predictable without the big swells that are near constant on the north shore in the Winter months. But, on any day, conditions can change and be unexpected. I completely missed paddling over the last weekend, and lately I’ve also blown the choice of craft to paddle, picking the OC1 when it’s been windy enough for great standup runs and choosing the SUP when it turned out to be light wind and sticky currents. So on Monday, when I had the chance to go, I intended to take full advantage. Hopefully, I’d pick the right paddle craft! Before loading up and leaving to catch my ride up to Maliko, I biked to my usual overlook to get an idea about what conditions would be like. That would help me choose whether to paddle my SUP or my OC1. Even though no swell was in the forecast, I noticed the reefs were lit up from Pier 1 all the way up to Spartan’s with average wind, probably in the low 20’s. I decided on the OC1. The white water I saw on the reefs was probably just a small bump, maybe from the approaching but degrading Hurricane Fernanda, still far to Hawaii’s south east. Driving down to the harbor a short time later, I nearly turned around to ditch the OC1 and grab my SUP instead. There were lots of dark clouds up the coast and the wind was really increasing, which sometimes happens ahead of the fast moving storm cells. Although I would rather have the SUP in bigger conditions, it was too late. I decided to make due. Run whatchya brung as they say in racing. I was sure the OC1 would be great, even if it got a bit windier. A handful of late-afternoon die-hards showed up for the 3 PM shuttle. A couple of guys with OC1’s, a pro-level woman from New Zealand paddling SUP and one other guy with a ski. None of my regular paddle partners were going. I’d be fine paddling by myself, but was a little disappointed that none of my homies would be going. Arriving at the gulch, the scene did not look inviting in the least. A storm had moved in just offshore and the clouds and water were indistinguishable from each other. All I could see, was just a big grey wall outside the gulch. There was also a small swell getting all the way into the gulch giving some local kids a chance to boogie board in the muddy brown water. At the mouth, significant surf appeared to be breaking. This would be consistent with the white water I’d seen breaking on the reefs earlier. I optimistically hoped that visibility would improve and the rain would blow through and thankfully, that happened. By the time I’d rigged my OC and walked down to the launch, you could see for miles, even though there were plenty of other squalls around. The wind had filled in quickly behind the passing rain clouds and I was surprised at how rough it looked. Still, I was concerned that one of the passing storms would catch me while paddling. These kinds of squalls, while usually short lived; can completely obscure visibility, making it difficult to find a way to your destination. Paddling out, I could tell right away that this was not going to be a typical summer run. The conditions resembled a winter day with a big NE wind-swell and strong wind in the mid to high 20’s. The surface was confused, with smaller swells running in several directions and periodically slamming into one another, creating a washing machine effect. It looked challenging but doable. As I went to start my Garmin, the dreaded LOW BATTERY message flashed. Here were epic conditions, and I wouldn’t even have a Garmin record. Dang it! After three years of OC1, I feel pretty good in my boat, even in bigger wind and wave conditions. On this paddle, I’d find my limits, both mentally and as far as my skill level. My first clue that this was going to be an intense experience was when the top of a breaking wave slammed into the side of the boat as I paddled out, perpendicular to the waves. In addition to the nasty thud, it nearly bounced me out of the seat. OC1 canoes are strong but not indestructible. You want to avoid putting your boat in places where it will be heavily stressed. Put a check mark in the screw up column and not even a half mile out. The ocean surface was all rolling in towards the coastline due to the large north component in the swell direction. At least the wind was not as northerly as the swell. To get outside and find a decent line, especially further down towards the outer reefs off Kanaha, where the swell could stack up and break, it would be best to work out as far as possible. The direction of the swell made it difficult to paddle straight out from Maliko. It was easier to bear off a bit and look for any runners heading to the outside. I found myself catching steep drops and working right then as quickly as I’d gotten on one that looked borderline scary, I’d run right off the swell into a flat, slow area. Even with the strong wind, it wasn’t feeling fast. The sooner I got outside, the sooner I could straighten out and run closer to the direction of the waves. I would just have to suffer through the process of slowly getting far enough out. I couldn’t see anyone else around except for the single standup paddler that launched about five minutes before I did. She is a super fit, elite paddler and I could tell that the SUP was far more difficult than the OC1 in the conditions, even for an expert paddler. Working out to the right would be even harder on the board. It didn’t take long before I glided by her on the outside. All around me were huge troughs and breaking tops. Even though everything seemed to be going pretty well as far as my boat was concerned, the ocean looked pretty spooky to me, even without looking back at the oncoming swells. Just seeing the deep, fast moving troughs trailed by huge following waves, was slightly unsettling. Still, feeling in control for the most part, slowly the familiar landmarks along the coast came and went. Without the Garmin, it was impossible to know what kind of speeds the boat was hitting. Several times, without meaning to, I ended up on drops where the wave trough just got deeper and steeper once I’d committed. The boat would pick up tremendous speed and I’d lean all the way back, hoping not to tumble out of control. When the nose would hit the bottom of the trough, it would bury completely up to the front i’aco, filling the self-draining cockpit with water and fully drenching me. While this is a blast, it is also somewhat risky as you’re putting a lot of stress on your boat. My mind began to play scenarios of the boat or the ama breaking during one of those unplanned, semi-out-of-control descents. I was growing more nervous. I worked hard to talk myself into doing what I knew would likely keep me safe: Steer carefully and don’t let the boat get sideways to the waves, try to keep the boat moving fast at all times to avoid being a sitting duck in front of any whitewater, stay far enough to minimize the chances of getting hit by a breaker and to maintain a good line into the harbor, stay focused and avoiding big, uncontrollable drops. It became apparent that these were the most challenging conditions I’d ever paddled in the OC1. The biggest swells would be from Camp One to the end of the run. But, usually, the wind mellows out on that final stretch. Not on this day. Near Camp One, the wind began to build quickly into the mid 30’s. The ocean took on a spooky look with lots of spindrift, noticeably building waves and breaking whitecaps nearly everywhere. As a dedicated (ok, obsessed maybe) downwind junkie, a part of me welcomed the building, nuking conditions. This would help to maintain boat speed, and there is something about feeling that power that is exciting. There was certainly no shortage of adrenaline in my aging body at that point and I was totally under a spell of excitement and fear. I have never seen such strong winds between Camp One and the harbor. Still, looking around at the water, I was genuinely concerned. If the worst happened, what would I do? I had my Personal Locator Beacon but the ocean looked so unfriendly. What would be a long but very possible swim on a ‘normal’ day looked completely hairy with the wind and waves. I forced the thoughts out of my head. The waves were slowing down when they hit the outer reef, stacking up and getting huge near Camp One. I have not often been terrified while down winding, but looking back and to the outside near outer Sprecks, I was nearly panicked by the size of the waves coming through. Yes, I was far out, but I happened to look back just as the first wave of a five wave set began steepening in the shallowing waters of the outer reef. I could not tell if these monsters would just roll as open ocean swells or ‘stack and jack’. Fortunately, they did not break but they were truly monstrous in size. The urgency of getting this run over with increased at that point. I felt like a speck, alone on an indifferent, powerful ocean. Alternating between feeling so lucky to experience the excitement of the conditions and the emotional sensation that I was an ungrateful fool that could possibly lose my life for the thrill of a downwinder. I recalled that the leading cause of death in Hawaii is drowning. Somehow, I shook loose of my distraction and got back to the task at hand. In a quest to keep moving quickly, I slid into another ugly trough and a big piece of crossing chop smacked into the back of the boat, hard. The boat went hard left, exposing the ama to the oncoming waves. Paddling on the left side was necessary to get the boat straightened back out but that means there is no means of bracing if you start to get pitched to the right. The last thing I wanted in those conditions was to be dead in the water, and huli’ed. It would be difficult to right the canoe and climb back on as rough as it was. Managing my fear of getting knocked over I took a couple of hard strokes on the left, fought the inclination to over steer back towards the right and let the boat gather a bit of speed to gradually turn back in line with the wave train. Even though your natural instinct is to push hard on the rudder, as that will just stall it and the boat will take longer to respond than if you give less input. Nearing the harbor, I was able to turn down and follow the wave train directly for the first time. I no longer had to keep trying to work right just to stay on my line. My speed increased as the boat caught glide after glide, sometimes with almost no paddling. Closing in on the jetty and the harbor entrance, the water was as rough as I’d ever seen it due to all the bounce-back off from the waves hitting the breakwater. With the very strong wind and waves now favoring my line totally, I was able to get inside with lots of speed even with the messy, rough water. As if to put the icing on the cake, just after clearing the harbor entrance, a tug began maneuvering to leave it’s dock with a huge barge in tow. Normally, I’d have turned hard left and waited in the lee of the break wall for the barge to get out. But it was just pulling away from the dock and the wind and waves would allow me to quickly head down towards the boat ramp, not my destination, but a safe alternative with the barge heading straight for the harbor mouth. It only took me a couple of minutes to get from the entrance to the edge of the shipping basin because of the unusually strong and northerly wind and wave directions. At that point, I did not care about paddling a bit farther at the very end in order to return to my destination beach. Once on shore, he other guys that had done the run in OC1’s and a ski had just come in, even though I’d never seen them. They were all talking about how epic and exciting the run was. This felt like a winter run in July! I felt the same way, but tempered with a large dose of gratitude for making it without disaster. I pushed my envelope that day and don’t think I’ll ever be comfortable in conditions that wild. I can survive them, but one misjudgment or a little bad luck on a day like that could result in a broken boat and unknown consequences in a raging ocean. The following day was sunny and bright. Winds were in the high 20’s and the surface was relatively small, lined up and predictable. I had one of my best SUP runs of the year, yes a perfect summer Maliko run. You never would have known how it looked less than 24 hours earlier. 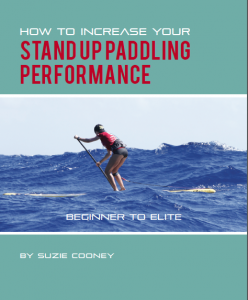 Surely, pushing my limits helped me to be a better paddler. We all do it, whether we’re intending to or not. But, I didn’t set out to push anything that day it just ended up that way. You get what you get out there, ready or not. Mahalo Gregg for yet another fantastic article. Great read! Got my heart rate up! Thanks for sharing the excitlement. Thank you! Glad you enjoyed it. That run got my heart rate up too! Sign Up Now and Get a $10 Gift Card!